I must admit I’m not that familiar with The Body Shop products, It used to be a favourite store of mine in my teen years but I haven’t tried their products lately. So when I was offered the chance to try their newest range of Wild Argan Oil products I jumped at the chance! The Wild Argan Oil range is derived from fair trade Moroccan aragn oil, which is extracted using traditional methods. Firstly, the fruits are sundried, then the argan nuts are removed and gently cracked open by hand with two stones. This reveals 2 or 3 kernels and only the best are selected. These kernels are then pressed, filtered and allowed to settle over 48 hours to extract the purest oil possible. Wild Argan Oil Body Butter 200ml (£13.00) – This body butter has a thick buttery texture that offers instant hydration on application. I used this after my bath and it made my skin super soft and supple. 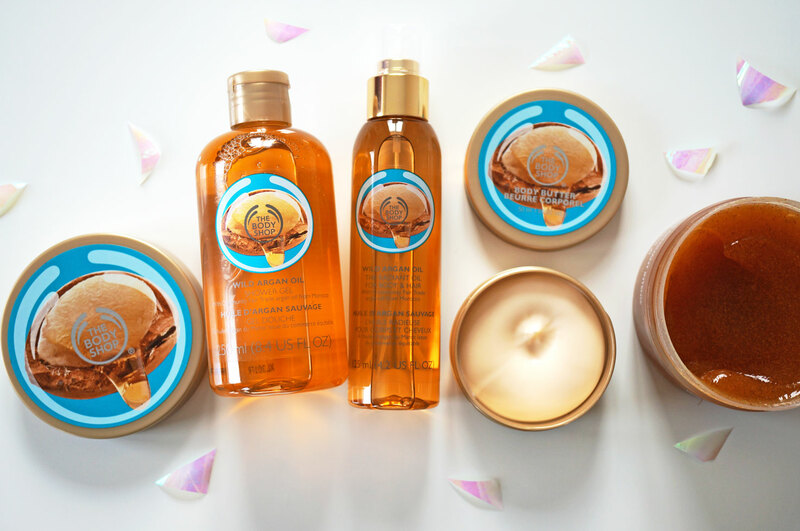 I also really love the scent of the Argan Oil collection, it reminds me of something but I just can’t put my finger on it! Wild Argan Oil Body Scrub 200ml (£13.00) – This is a gorgeous product including argan shell exfoliants to scrub away dead and dull skin cells, helping to stimulate the skins surface and leaving you looking and feeling radiant and fresh. I’m always cautious when it comes to exfoliators due to my crazy sensitive skin – anything that’s potentially abrasive must be carefully checked out tested! I’m pleased to say that this scrub was fantastic, it did just what it said on the tin and left my skin feeling soft and happy! Wild Argan Oil Shower Gel 250ml (£4.00) – Another one that did exactly what it said on the tin – this beautifully scented soap free shower gel gave a nice thick lather (I do love a good lather!) and didn’t dry my skin out at all. Wild Argan Oil Radiant Oil 125ml (£14.00) – I love this all rounder product, this Radiant Oil is a beautifully rich, dry oil for hair and body that leaves both hair and skin super silky to touch. Overall these products are just fantastic, I really don’t have a bad word to say about them! They do what they’re supposed to do and are really affordable, I’d definitely recommend all of them and I can’t wait to try out some more Body shop products now! Next Post A Pretty Winter Pastel Outfit with Wal-G!